Although we didn’t stay in the city of San Jose itself, we spent part of our holidays in the hills just north of the city. We were thrilled that we did, because the beautiful hills and cooler days provided a wonderful counterpart to the warmer weather by the ocean. We hired a guide for a day, and Leo took us to the Poas volcano in the morning. Although it was cloud-covered while we were there, we could just see the rim of this still-active volcano. 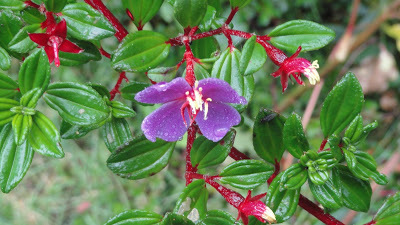 At an altitude of nearly 9000 feet, we enjoyed the short walk to the edge, seeing the hardy plants that live there (including Poor Man’s Umbrella and Monkey’s Tail fern). In the afternoon, we shopped in the town of Sarchi, known for its crafts, particularly the hand-painted oxcarts typical of the region. 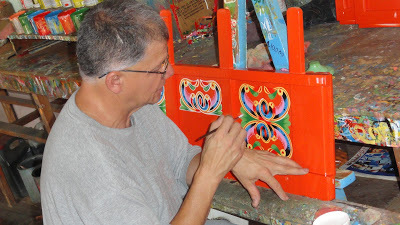 While we were in one shop, we watched an artisan painting a side of a cart with finesse. If we’d stayed longer, we would have loved some of the other excursions. 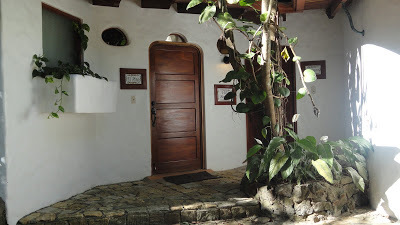 Finca Rosa Blanca is a working coffee plantation, and they offer a tour of their farm. I still regret that we didn’t have the chance to visit a school in the local community, too. The hotel itself was the reason we spent several days near San Jose, and it’s a decision we didn’t regret. It really is one of the loveliest properties we’ve ever stayed at, set in the quiet countryside less than half an hour from the city airport. But it seemed miles from anywhere. Each evening we sat out on our terrace, watching the twinkling lights of San Jose in the valley below, before walking down the leafy path to the hotel restaurant. The pool was just two minutes from our room, but completely hidden behind the foliage. With a built-in waterfall and a hot tub on the upper deck, it was a wonderful place to relax and enjoy the sun. We loved the philosophy of Finca Rosa Blanca as much as anything. They are devoted to sustainable tourism, unlike many properties that pay it lip service for marketing purposes. Glenn and Teri buy most of their supplies from local merchants and support several schools and environmental causes. They also have a number of initiatives in place to protect the water supply and to leave as small a trace on the environment as possible. Although we had a delightful lunch out in the village of Sarchi, the food at Finca Rosa Blanca was incomparable. We ate all of our breakfasts on the restaurant’s beautiful, leafy terrace. One of my daughters swore by the French toast, but I loved the Costa Rican breakfast with rice and beans. And all three dinners we ate there were terrific. The fish specials every night were great, but the steak and pork on the menu were equally good. And the chef very graciously prepared a plain pasta for my daughter with less-adventurous taste buds. P.S. If you read my guest post on the i-escape blog, the photos that accompanied it were supplied by them (except for the one of me). But the photos on this post were all taken by Andrew! Wow, San Jose is beautiful! Oh, wow. That looks AMAZING! I've always wanted to go to Costa Rica, but I still haven't gotten around to it. Your post makes me want to book a ticket immediately. I'm still aa-hing over that bed…still imagining that bed is mine………..
Beth, my hub and I have been wanting to visit Normandy. After all the articles I've read in travel mags, your previous post said more than anything I've read. Question: Which of the places you stayed at offered easiest access to sightseeing? I'm at kittiehoward@gmail.com and would be most grateful for any insight you could offer. We're thinking about going late next spring/early July. Thanks!! Oh my gosh, I want to be there right now. I went about 10 years ago to Tamarindo and it was one of the most beautiful trips I have ever taken. I'd love to go back. That hotel looks amazing. Oh. My. Gosh. I am green with envy! That must have been an amazing trip. Those photos are gorgeous. The artisan painting the cart would have been an interesting stop for me. I love seeing the arts in the very act of their creation. Kittie, I'd love to tell you about our trip. I'll email you with this information, but I think you'd love the place we stayed in Bayeux. If you're at all interested in World War 2 history, it's close to everything, and the Bayeux tapestry is incredible. What a gorgeous place! I really need a vacation! Lovely! 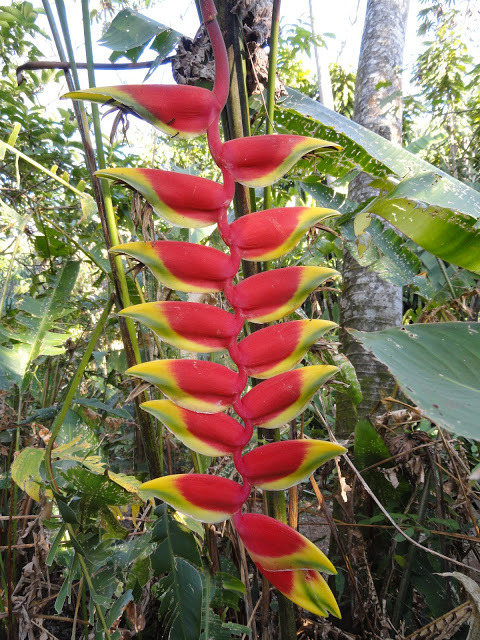 I really enjoyed all of the beautiful and interesting plants in Costa Rica. I swear to God, there's something about breakfasts in foreign countries that's absolutely transporting. I STILL vividly remember all of the breakfasts we ate in Europe, from the spectacular to the mundane. Just amazing. San Jose is one place that I have been dying to visit. I'd love to start the day with local foods, and imagine that the seafood in that region is amazing. Oh, man! I'm jealous. :o) That looks gorgeous and so relaxing. Thanks for the heads up about places to go and stay when someday–not if!–I get to go on an ecotourist trip. :o) Thanks for sharing! Your trip sounds fantastic! Looks like the most beautiful place. 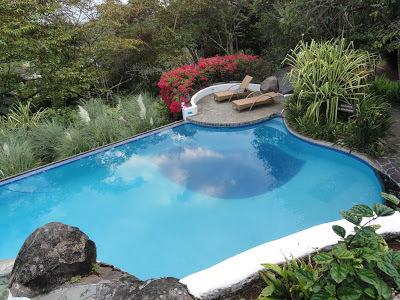 I would have loved a nice dip in that pool and a view of that gorgeous foliage! Look at all the beautiful colors and warm sun! Looks like you had a fantastic time Beth ~ good for you! Your post made me realize how much I need vacations. Beautiful place Beth! Iam glad you had such a great time! What a beautiful place to stay. You are single-handedly expanding my "Places to See" list. I would have enjoyed watching the painter work, and visiting the farm. A few years ago I had made plans for a memorable trip to be had in Costa Rica. Unfortunately God had other plans. Mom got some very bad heath news and I decided the trip had to be postponed. Reading your post was a reminder that I need to re-plan a voyage to this wonderful island. Thanks Beth for a peak through a small part of your travels. Wow, that trip sounds dreamy. How neat that they try to preserve the environment! And that pool….I'd like to be in it right now. Thanks for the virtual vacay! Sounds like a perfect getaway right about now! Oh what gorgeous photos! Given how cold it is here, I definitely wish I were someplace nice and tropical like this right now! I'm curious Beth. Were you able to travel as much when your children were younger? Your family seems to get around a lot–so lucky! I would move to Costa Rica in a heartbeat! We went in 2009 and fell in love with the country. The people, the culture, the land…everything was beautiful. I'm glad you loved it too.